Here you'll find shortcuts to frequently used Georgetown apps and helpful guidelines on setting up your NetID and password, accessing course materials, and troubleshooting any IT issues. 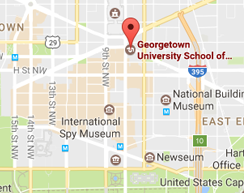 Your Georgetown email address is yourNetID@georgetown.edu. Most on-campus courses use Blackboard to share class resources and course announcements. Students enrolled in online courses will use Canvas. To access Canvas, visit georgetown.instructure.com and log in with your Georgetown NetID and password. If you have forgotten or do not have your Georgetown NetID password, visit the University Information Services (UIS) 24/7 IT Helpdesk website to reset it.